This year’s Oscar nominated short films will be playing in many parts of the country beginning Friday, Jan. 31. In Denver, live-action shorts and animated films will be shown at Landmark’s Mayan; the documentary shorts will play at the Sie FilmCenter. It’s not possible for me to review all of the 15 nominated short films here, but I will tell you that while watching them, I was buoyed by what the entire effort says about the vitality of film culture. This year’s crop of shorts — which seems particularly strong — ranges from the whimsical (the delightful animated short Room on the Broom) to the emotionally devastating documentary (Facing Fear). Room on the Broom — which includes voice work by Gillian Anderson, Sally Hawkins, Timothy Spall and Simon Pegg — tells the story of a witch who teaches a quartet of jealous creatures that they really all can get along. Facing Fear tells the story a chance meeting between a reformed Neo Nazi and the gay man he nearly beat to death 25 years previously. It’s a powerful film about reconciliation. In the animation category, I was most taken with Shuhei Morita’s Possessions, a beautiful and imaginative look at a folk legend based on the notion that objects that last for 100 years acquire souls and are able to play tricks on people. But don’t discount Disney’s Get a Horse!, which mixes Mickey Mouse nostalgia with clever new twists. Disney showed the short prior to its full-length animated feature Frozen, which also has been nominated for an Oscar. A new wrinkle has been added to the live-action program. Between each film — they range in length from 13 to 30 minutes — you’ll find brief comments from filmmakers, some of whom have won Oscars for short films. These comments can feel repetitive, but they offer welcome breathing room between films that can have plenty of impact. Among the live-action films, I suppose my favorite was The Voorman Problem, which tells the story of an imprisoned man (Tom Hollander) who claims to be a god and who meets with a psychiatrist (Martin Freeman) who has been charged with determining whether Hollander’s Voorman is insane. But that doesn’t negate the value of the other shorts. The French entry — Just Before Losing Everything — introduces us to a woman who’s trying to escape (with her two children) from the clutches of her physically abusive husband. Director Xavier Legrand builds enough tension to stock two films as the woman (Lea Drucker) literally runs for her life. 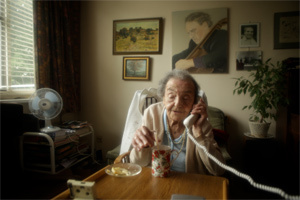 This year’s documentaries are equally strong, embracing subjects as far ranging as the lethal attempt to squelch a 2011 protest in Yemen’s Change Square (Karama Has No Walls) to the life of a 109-year-old Holocaust survivor (The Lady in Number 6: Music Saved My Life). The Lady in Number 6, perhaps the favorite for an Oscar in this category, tells the story of Alice Herz Sommer, a pianist whose musical skills kept her alive in Theresienstadt, the concentration camp where the Nazis made hideously fraudulent propaganda films about how wells Jews were being treated. 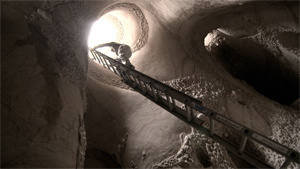 And if you’re looking for a documentary about a strange pursuit, try Cavedigger, the story of New Mexico artist Ra Paulette, who digs caves and turns them into art environments. For tough film, try Prison Terminal — The Last Days of Private Jack Ryan, a 40-minute documentary about a World War II vet’s last days in a prison hospice. Ryan was serving a life sentence for murder. The documentary airs on HBO on March 31. I’ll stop there, but I encourage you to see all of these programs. Not only are they individually worthy, but together, they serve as a tonic for filmgoers who still want to believe in the transformative power of cinema. Put another way, the shorts programs are a great way to refresh jaded cinema palates.